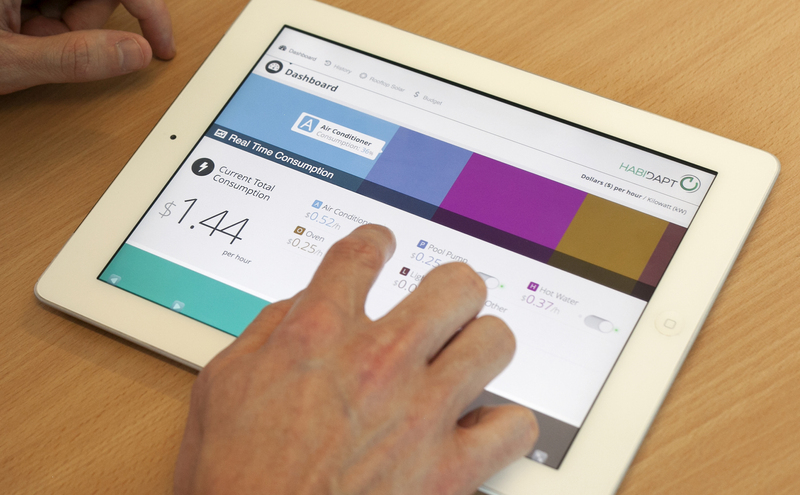 Eddy gives people more control over their energy usage, helping them to save money. Electricity prices, poles, wires, peak demand. Pick any combination of words and you’ll find a raft of news pieces, heated debates and public protests. ‘Poles and wires’ was an issue that led the NSW state election this year, and bill woes led to 58,000 properties in Victoria being disconnected in a single year. It’s an inescapable cost for the consumer and the environment. But it’s also one that can be managed, by quite literally taking things into your own hands. That’s why we’ve developed a new system that takes smart metering a step further, allowing consumers to monitor their electricity consumption in real-time and control high-drain devices remotely using an online interface – on a computer, smartphone or tablet. The system, known by its friends (and the market) as “Eddy”, is being commercialised by Australian company HabiDapt. Eddy will send consumers personalised insights and recommendations about their electricity use, and take part in demand management schemes with incentivised pricing for additional savings. Think of Eddy as your own efficient energy consultant. This is a terrific example of the Internet of Things (IoT) – where real world items are made smarter by connecting to the internet – sadly not all IoT ideas are a winner: Wi-Fi diapers anyone? We think Eddy is one of the more grounded systems to come out of the IoT trend. Using cloud-based software and mini smart meters, Eddy allows you to control your appliances remotely. You could even automate the process using the online interface. The technology is based on our sophisticated Energy Management System, which has also been adapted for use on King Island’s Smart Grid. The research group behind the electricity management system was led by Brad Sparkes (nominative determinism anyone? ), who points out that houses with solar PV installations stand to gain even more, as Eddy can be programmed to prioritise running high-drain devices like pool pumps when the house is generating excess power. If the sun doesn’t shine for a few days, the pool won’t go stagnant, as the system is smart enough to recognise when to use grid power instead. HabiDapt is currently trialling the technology in homes with solar PV systems in Perth, and is also rolling the system out with Ergon Energy in Townsville, where it is being offered to customers as ‘HomeSmart’. Use the Green Savings calculator to make your house greener. Use the tool to identify a variety of ways to save on energy and water costs plus a whole lot more. Use the cold cycle in your washing machine. Heating water during a washing cycle accounts for 90% of the energy use of the appliance. Be smart about using your dishwasher. Run the dishwasher during off-peak times (often overnight). Ensure that it is full and the dishes are stacked efficiently. Try not to use the dryer. Opt for a clothes airer or clothesline. Ditch the beer fridge. Sacrilege I hear you scream! But it will save you a heap of money. Let us know your favourite power-saving tips in the comments section below. If you would like to find out more about Eddy, visit Habidapt’s website. To learn more about our work in energy, head to our website. I have purchased a couple of sonoff pow switch/controller/power monitor. They work well so is this the same thing. A meter on each appliance. I would need about 20 of them to cover all used power points. Good idea but many households don’t have always on wifi internet. In Victoria, can it use the comms built into the 2.8 million smart meters as an alternative? For those retail consumers who have opted for a “time-of-use” electric power tariff, EDDY like other smart devices, is handicapped by the reluctance of distributers/billing authorities to notify consumers in advance of sporadic short duration tariff changes triggered by peaks and troughs in the supply network. My distributer now decides timings for my nightly “hot water” reduced tariff thereby preventing my smart device from programming the HWS thermostat for minimal heat loss over a 24 hour day. The idea is great. Is it any different to Neurio? We don’t have a smart meter, but I record and graph our home electricity, gas & water usage. I also compare the numbers with the weather data, which helps when understanding high or low usage, and ways to reduce usage.